There are 8 reviews of Dolly Girl. I bought this fragrance as well as its follow-up "Ooh La Love" because of the cute bottles, so I didn't really care what they smelled like. Having said that, this fragrance isn't terrible, it's just not remarkable. A bit too sweet for me; I prefer the less-sweet "Ooh La Love" for that reason. I didn't have high expectations prior to testing this fragrance, and not surprisingly I wasn't blown away by this scent. There was nothing unpleasant about it, but then again there was nothing overly wonderful about it either. Looking at all the unique and interesting notes listed, I'm wondering where all those notes were. I could definitely not smell cinnamon or melon in the top notes, which is a damn shame, because those notes when blended with the apple and bergamot should have created something interesting. However, I was met with a scent that can only be compared to a cheap drugstore fragrance. What is supposed to be a beautiful heart of florals, turns out to be so faint that you can hardly smell it. In fact, Dolly Girl hardly lasts at all. It's possibly one of the worst fragrances when it comes to lasting strength. I didn't get any of the powderyness that everyone is describing here, instead I got a big jumbled mess of fruits and flowers, making it very difficult to distinguish any particular notes. Although I find the bottle design creative, up close it looks rather cheap and tacky. Unfortunately there's nothing about Dolly Girl that I actually like. Even the name is a little ridiculous and childish. I haven't tried the other fragrances in the Dolly Girl series, but here's hoping they are much better than the original. I love the bottle, I was looking for a summertime scent and this fit the bill to a T. I smell a definite ruby red grapefruit....or some citrus notes. Its fresh and gorgeous and very sparkly and happy. Its not sultry at all, maybe flirty in an innocent way. I love this! Beautiful! It's the pink grapefruit that does it for me, its playful, sparkling, lively and girly. It's just fab! Weird bottle. A manequin head...I wonder how it would look with the JPG manequin body?! Anyway, this scent is really cheap & sweet. Overall, I have to agree with STARBRITEGIRL on this one. Not a scent for introverts, or anyone who's reached an age of maturity. If you're playing "dress-up" go for it. I think this scent is delicious - sweet and sparkling and light. Best treated as an even younger, even frothier YSL's Baby Doll (which is sharper and with slightly more depth and substance), it's aimed squarely at girly girls who love to play dress-up and aren't afraid of glitter in broad daylight. As such it isn't a seductive perfume, tends not to offend or overpower, and is more likely to be liked by girls than boys, which makes it perfect for teenagers - but it suits any girl who wants to celebrate her fluffy and frivolous side. Anna Sui Dolly Girl 1.7 FL OZ Women's Eau de Toilette Spray - Sealed in box!!! 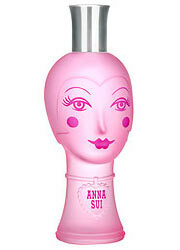 Anna Sui Dolly Girl Eau de Toilette 1fl.oz./30ml. ANNA SUI DOLLY GIRL 75ML EDT TESTER (NO CAP) WOMEN NEW IN BOX. There are no member images of Dolly Girl yet. Why not be the first?